The Virgin Mary is known by many titles (Blessed Mother, Virgin, Madonna, Our Lady), epithets (Star of the Sea, Queen of Heaven, Cause of Our Joy), invocations (Theotokos, Panagia, Mother of Mercy) and other names (Our Lady of Loreto, Our Lady of Guadalupe). All of these titles refer to the same individual named Mary, and are used variably by Roman Catholics, Eastern Orthodox, Oriental Orthodox, and some Anglicans. A few of the titles given to Mary are dogmatic in nature. Many other titles are poetic or allegorical and have lesser or no canonical status, but which form part of popular piety, with varying degrees of acceptance by the clergy. Yet more titles refer to depictions of Mary in the history of art. 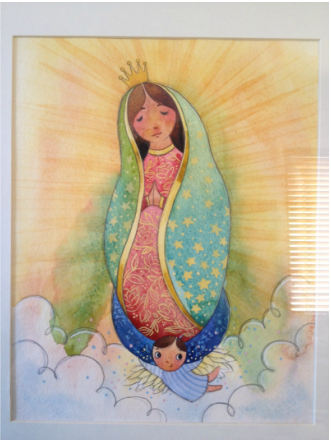 Various artists come together to exhibit their own interpretation of La Virgen, the Virgin Mary. Exhibit on display now through December 30th. To the people of Teocaltiche Jalisco Mexico she is know as La Virgen de los Dolores, the miracle worker who comes to those in serious need. To me she is “Mi Virgen” my namesake. Thirty years ago, I was born ill and at six months, my parents stood in front of the virgen and asked for a miracle. They promised the virgen if she saved my life I would carry her name Dolores, for the rest of my life as a thank you for the miracle and so as promised my name is Dolores. Now every time I visit her I thank her and ask for a little miracle, I ask to please continue to have a happy life with my significant other and in return I will make the effort to visit her when ever I am near. 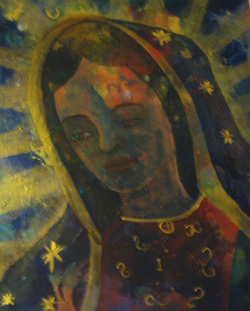 In this work I painted a person in each eye, to give the viewer a feeling that the virgen is looking back at them or looking at my promise, to visit her whenever I am near. To me she is more than just “La Virgen of Teocaltiche” she is “Mi Virgen” and I thank her for the wonderful life she has given me. 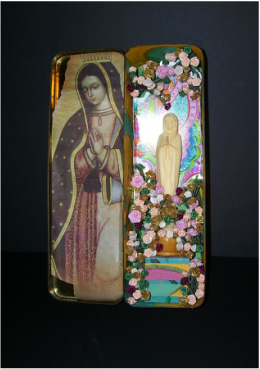 Over the years La Virgen has miraculously appeared to those devoted to her. Her likeness has been found in toast, tree stumps, and random buildings. Is it a miracle or our deep desire to see a piece of the divine? I present another aparición of La Virgen, found in the reflection of a window. 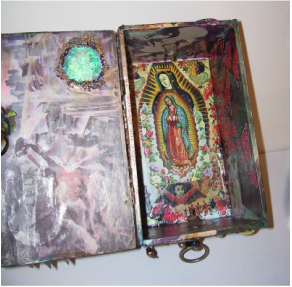 and its repurposing of the Mary mythos. A used tin makes for a simple flower adorned shrine for the Virgin. A reminder that her spirit is everywhere and can be found anywhere beauty resides. and on her head a crown of 12 stars…. The Virgin Mary is portrayed in the most mundane context, a washroom. 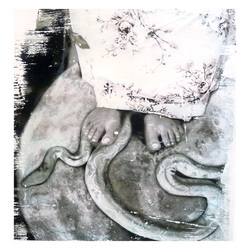 The photograph juxtaposes her holy radiance with a profane setting. Rather than a supernatural being held up by an angel and eyes lowered in humility, here we find the Virgin looking straight at us from a public restroom. We are given the sense that she is one of us, and has experienced the full human condition. Most portraits of the Virgin Mary depict her held by angels, surrounded in the light of her glory, and her eyes lowered in prayer. This photo depicts the Virgin in a very different context. She is caught looking over her shoulder in the filtered sunlight as she strolls through a garden. She appears to be an average young woman captured during a private moment. There is a spirit that supports our city. 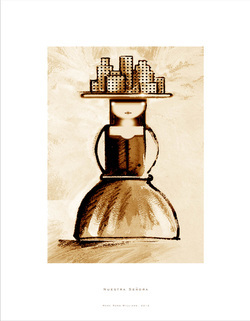 She is the foundation and caretaker of everyone who lives here. We can show our respect by cooperating with each other peacefully. 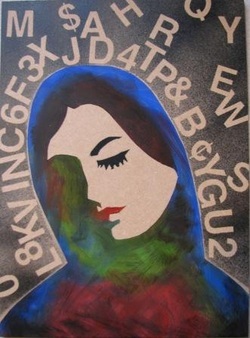 In a graphic arts style, the Virgin Mary is shown surrounded not by radiant light, but by letters and numbers. Portraying her in this manner emphasizes her humanity, simplicity, and contemporary relevance. 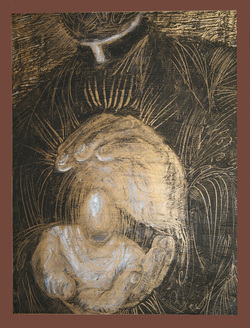 My piece is about finding the Madonna within. In times of internal darkness or conflict, we need light for balance. The Madonna represents the light for this balance. When darkness takes over, look into the deep where the Virgin’s light resides. It is there, she is there. Call for her and she will answer. Murder, immense wealth, corruption… The brutal cartels of Mexico fight amongst themselves and the government for the control of not only the drug trade, but the Mexican people. Fear, intimidation, and blood overflow in the streets. 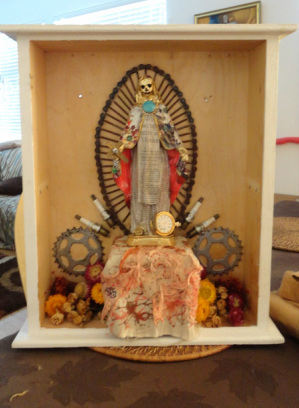 La Virgen of Guadalupe has become Our Lady of Collateral Damage. Mexico is a place that I have visited many, many times and is very dear to me. Therefore, I know first hand about the people’s devotion to the Virgin. 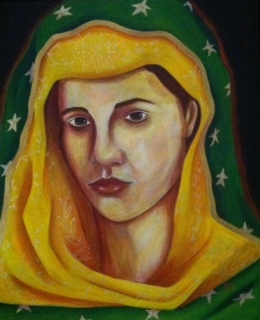 My piece, La Luz, is an attempt to capture just some of the Mexican people’s interpretation of the Virgin. But, It is also intermingled with my own personal feelings. 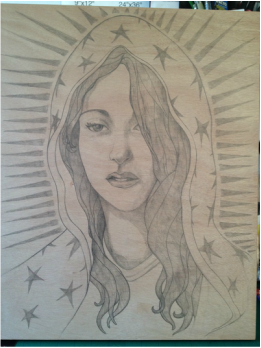 The Virgin, in various forms, is part of the everyday fabric of Mexico’s people and is taken very seriously. My goal is to have the viewer understand the significance of this imagery as part of a belief system, even if they do not subscribe to that system. I hope this painting captures just a modest amount of the wonder and devotion that peoples from all over the world feel for the Virgin in all her forms. 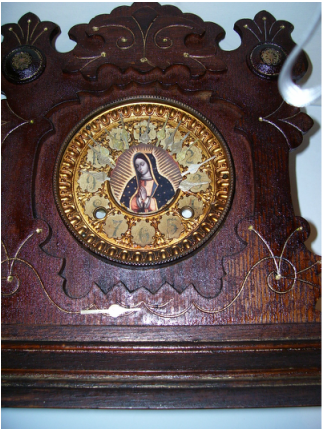 An old clock decorated with an image of Guadalupe reminds us that her protection, guidance and care are available to all at anytime. In my family it was second-nature to explore hobbies that involved art, and I returned to school to study metal-work and jewelry design. As my work evolved, I began incorporating found objects and vintage glass with leather and metals. The earth and everything on it is an extraordinary gift. To be able to repurpose something created by an artisan countless years ago into one of my own works is a joy. To incorporate the treasures washed onto the shore from the ocean is a wonder. I want to express the beauty and mystery of this earth through my artwork in a way that will allow people to carry it with them. I have tried to merge the beauty of things on the earth with the inspiration of the heavens. This accessible art carries with it not only my artistic vision, but the work of unknown craftspeople and sublime touch of nature. Every piece tells a story. With some it is the vintage German beads or Venetian glass which accent a religious symbol. With others it can be a piece of coral or shell, sculpted by the sea. or on your fridge. Or give her to a friend to share a prayer.